Mysterious money-bags Bad Black and Meddie were arrested on Wednesday afternoon by Uganda Police after a tip off by interpol and are yet to appear before Buganda Road court today, Thursday. Bad Black does not deny that she was arrested and in fact she is talking of her going to court on Thursday. Apparently the reason for the two being arrested is on allegations of money laundering after a UK Diplomat complained about the two. Bad Black blackmailed the guy with a baby that is not his before millions of dollars were wired to her. 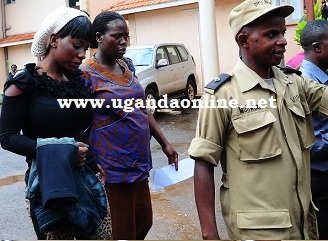 She will be presenting her case at Buganda Road based court. Meanwhile, Bad Black has in the recent past been attacking all those on her case that she does not know English saying that she even employs graduates in her home so that is no big deal.